Thiruvananthapuram: The counting of votes for the Aruvikkara assembly by-election, that saw a whopping 77.3 per cent voter turnout, began at 8 am at the Music College at Thycaud on Tuesday morning. With the first two rounds of counting completed in the Aruvikkara by-poll, UDF candidate K S Sabarinathan has held on to his initial lead. Right behind Sabarinathan is LDF candidate M Vijayakumar followed by BJP veteran O Rajagopal and NOTA (None of the Above). Initial results suggest that BJP has made in-roads into the Kerala politics. UDF has swept the first two panchayats of Tholicode and Vithura were counting has been completed with a lead of 1422 and 1052 respectively. At this stage of counting, Sabarinathan has more leads than what his father G Karthikeyan had when the latter contested the Assembly poll in 2011. The counting of votes for the Aruvikkara assembly byelection, that saw a whopping 77.3 per cent voter turnout, started at 8 am at the Music College at Thycaud. The first trends will be out at 8.30 am. The winner will be declared by 11:30 a.m.
K S Sabarinathan of the UDF and LDF’s M. Vijayakumar is locked in a neck-and-neck fight for the assembly constituency while BJP’s O Rajagopal makes any forecast difficult. Postal votes will be counted at the returning officer’s table. Then electronic voting machines from the 153 polling booths spread over eight panchayats will be counted over 14 booths. A round of voting covers 14 booths. The results will be out after the 11th round of counting. The votes will be counted from Tholicode to Vithura, Aryanad, Uzhamalaykal, Vellanad, Aruvikkara, Poovachal, Kuttichal, in that order. Panchayats which has more than 14 polling booths will take more than a round to be counted. Counting starts with the 17 booths of Tholicode and then the 19 booths of Vithura. The United Democratic Front considers Tholicode as its stronghold while Vithura usually goes with the Left Democratic Front. The LDF is supposed to have an upper hand when votes from the 20 booths of Aryanad and the 13 booths of Uzhamalaykal are counted. UDF centres of the 20 booths of Vellanad follow. Ditto with the 24 booths of Aruvikkara and 27 booths of Poovachal. The 13 booths of Kuttichal will be decisive in determining the LDF fortunes. The BJP is expected to be a game changer in Vellanad, Aruvikkara and Vithura panchayats. The UDF had an upper hand in all the eight panchayats when G. Kartikeyan was elected in 2011. 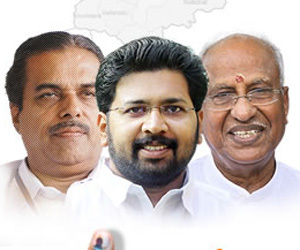 The LDF, however overtook the Congress candidate in Vithura, Aryanad, Uzhamalaykal, Aruvikkara and Poovachal panchayats in the Lok Sabha election of 2014.